Durable Medical Equipment (DME) is generally defined as medical equipment and supplies that are not disposable, but are medically necessary and are appropriate for home use. Some states requires businesses that dispense DME, prosthetics, orthotics and supplies to obtain a Durable Medical Equipment License. To acquire a DME license, certain specific criteria must be met in addition to submission of an application to the appropriate state licensing agency. This requirement is separate and distinct from Medicare/Medicaid registration by DME providers for insurance purposes. A DME retailer sells Durable Medical Equipment directly to the end user. If you are a DME retailer or a pharmacy that sells DME, oxygen, or diabetic testing supplies, you may require a license in each state where supplies are sold. The application process typically entails certificates of corporate status and list of corporate officers, current resident state licensing or registration, a current facility inspection report issued by the resident state or an accreditation certificate from an approved organization. In some states, a Sales Tax Permit is also required. DME retailers who render services to Medicaid beneficiaries must be sure to register within each individual state in which sales and services will be dispensed. If your business intends to bill Medicaid for Durable Medical Equipment services and appliances, or oxygen related equipment, then you will be required to enroll within the state of service provision as a Medicaid Provider. In most states, businesses may register with The Department of Community Health or Inspector General. To enroll, businesses must be prepared to supplement the state’s enrollment form with their IRS assignment Letter indicating their FEIN Tax ID numbers, their business licenses, certifications of staff members qualified to provide services, a DME Provider Information Request Form, a copy of your Medicare award/ participation letter from your home state, an Electronic Funds Transfer (EFT) Authorization Form, and an application fee (which varies by state). Providers who intend to bill patients and their medical insurance for supplies and services must also register with the federal government through the Department of Health and Human Services Centers for Medicare and Medicaid Services (CMS) Medicare/Medicaid Provider-Supplier enrollment process. In order to establish and maintain billing privileges, suppliers must meet a set of requirements under the Affordable Care Act and published in the Federal Register. These rules were designed to detect and prevent fraud, waste, abuse, and to ensure quality care for beneficiaries. Specific standards include: compliance with all applicable federal and state licensure, regulatory, and accreditation requirements, compliance with disclosure and pricing notification requisites, delivery, maintenance, and repair standards. Suppliers are also required to submit to on-site inspections of facilities to ensure that premises are appropriately maintained. CMS Medicare/Medicaid Registration specifically and exclusively pertains to acquisition of supplier billing privileges. DME businesses that bill Medicare/Medicaid patients will place themselves at financial risk if they fail to register. However, businesses that do not bill patients are not required to apply for a Medicare/ Medicaid Billing number. For more information and to apply, go to the Center for Medicare & Medicaid Services. Whether you are a DME wholesaler or retailer, LicenseLogix can prepare and handle all state issued DME licenses. LicenseLogix does not handle Medicare or Medicaid registration at this time. 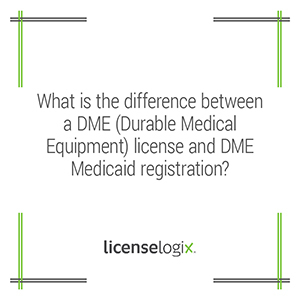 To get started on your DME license, fill out the box on the right or call us today at 800-292-0909.